This section lists a selection of (recent) scientific literature references focussing on Pelargoniumspecies, their morphology and taxonomy. Numbers in square brackets refer to the author's library catalogue entry (please write if you'd like a copy). Where available Open Access, the original publication is added and the relevant Creative Commons license cited. For a list of books and monographs, please see below. Albers F., Becker M. (2010), Phylogeny and speciation in succulent Geraniaceae (Geraniales). Schumannia 6, 59-68. Albers F., van der Walt J. J. A. (1992), Karyological and chemotaxonomical studies of the hybrid Pelargonium incarnatum x P. patulum (Geraniaceae) and its parents. Plant Systematics and Evolution 183, 161-167. Albers F., Gibby M., Austmann M. (1992), A reappraisal of Pelargonium section Ligularia (Geraniaceae). Plant Systematics and Evolution 179, 257-276. Albers F. (1990), Comparative karyological studies in Geraniaceae on family, genus and section level. Vorster P. J. (Ed. ), Proceedings of the International Geraniaceae Symposium, University of Stellenbosch, pp. 112-122. Albers F., van der Walt J. J. A. (1984), Untersuchungen zur Karyologie und Mikrosporogenese von Pelargonium sect. Pelargonium (Geraniaceae). Pl. Syst. Evol. 147, 177-188. Bakker F. T., Culham A., Marais A. B. de, Gibby M. (2005), Nested radiation in Cape Pelargonium. In: Plant species-level systematics : New perspectives on pattern & process, Bakker F. T., Chatrou L. W. (Eds. ), Koeltz scientific books (Regnum Vegetabile 143), pp. 75-100. Bakker F. T., Culham A., Hettiarachi P., Touloumenidou T., Gibby M. (2004), Phylogeny of Pelargonium (Geraniaceae) based on DNA sequences from three genomes. Taxon 53, 17-28. Bakker F. T., Culham A., Pankhurst C. E., Gibby M. (2000), Mitochondrial and chloroplast DNA based phylogeny of Pelargonium (Geraniaceae). American Journal of Botany 87, 727-734. Bakker F. T., Culham A., Daugherty L. C., Gibby M. (1999), A trnL-F based phylogeny for species of Pelargonium (Geraniaceae) with small chromosomes. Plant Systematics and Evolution 216, 309-324. Bakker F. T., Hellbrügge D., Culham A., Gibby M. (1998), Phylogenetic relationships within Pelargonium sect. Peristera (Geraniaceae) inferred from nrDNA and cpDNA sequence comparisons. Plant Systematics and Evolution 211, 273-287. Bakker F. T., Culham A., Gibby M. (1996), Molecular phylogenetic relationships within Pelargonium section Peristera (Geraniaceae). American Journal of Botany 83, 138-139. Bauer H., Treutter D. (1990) Identification of Pelargonium genotypes by phenolic fingerprints. 2. Cultivar identification by HPLC analysis of leaf phenols combined with discriminant analysis. Gartenbauwissenschaft 55, 187-191. Becker M., Albers F. (in press), Taxonomy and phylogeny of two subgroups of Pelargonium section Otidia (Geraniaceae). 1. The Pelargonium parviflorum complex. Bothalia. Becker M., Albers F. (2010), Pollinator shift and speciation in Pelargonium alternans (Geraniaceae). Schumannia 6, 59-68. Becker M. (2008), Pelargonium albersii, a new species of Pelargonium section Otidia (Geraniaceae). Schumannia 5, 157-168. Becker M., Albers F. (2008), Revision of the 'P. crithmifolium group' of Pelargonium section Otidia (Geraniaceae) including the description of the new species P. anauris. Schumannia 5, 169-180. Becker M., Schäper K., Albers F. (2008), Description of two new taxa of Pelargonium section Otidia (Geraniaceae), P. keeromsbergense and P. laxum ssp. karooicum. Schumannia 5, 181-190. Becker M, Albers F. (2007), Pelargonium dasycaulon (Geraniaceae) – eine vergessene Art, Kakteen und andere Sukkulenten, 58, 239-240. Becker M., Albers F. (2005), Was is Pelargonium parviflorum? Avonia 23, 31-39. Becker M., Albers F. (2005a), Pelargonium adriaanii (Geraniaceae), a new species from the Northern Cape Province, South Africa. Bot. Jahrb. 126:153-161. Carolin R. C. (1961), The genus Pelargonium L'Hér. ex Ait. in Australia. Proc. Linn. Soc. N.S.W. 86, 280-294. Chow T. W., Harney P. M. (1967), Biosystematics of Pelargonium - crossability and morphological studies in subgenus Ciconium. Canadian Journal of Genetics and Cytology 9, 658. Coffin J. L., Harney P. M. (1978), Intersubgeneric crosses within the genus Pelargonium. Euphytica 27, 567-576. Craib C. (2001), Pelargonium nephrophyllum: Geraniaceae. Curtis's Botanical Magazine 18, 149-152. Craib C., Condy, G. (2001), Pelargonium oblongatum: Geraniaceae. Flowering Plants of Africa 57, 76-80. Daker M. G., (1969), Chromosome number of Pelargonium species and cultivars. J. Roy. Hort. Soc. 94, 346-353. Dyer, R. A. (1957), Pelargonium jacobii. Bothalia 6, 432, 450.
de Marie E. (1990), A case for the transfer of three Pelargonium species from section Ligularia to section Ciconium. Hystrix 2, 5-8. Dreyer L. L., Albers F., van der Walt J. J. A., Marschewski D. E. (1992), Subdivision of Pelargonium section Cortusina (Geraniaceae). Plant Systematics and Evolution 183, 83-97. Gibby M., Hinnah S., Marais E. M. (1996), Cytological variation anti evolution within Pelargonium section Hoarea (Geraniaceae). Plant Systematics and Evolution 203, 111-142. Gibby M., Albers F., Prinsloo B. (1990), Karyological studies in Pelargonium sections Ciconium, Dibrachya, and Jenkinsonia (Geraniaceae). Plant Systematics and Evolution 170, 151-159. Gibby M. (1990), Cytological and morphological variation within Pelargonium alchemilloides s.l. (Geraniaceae). Mitt. Inst. Allg. Bot. Hamburg 23b, 707-722. Gibby M., Westfold J. (1986), A cytological study of Pelargonium sect. Eumorpha (Geraniaceae). Plant Systematics and Evolution 153, 205–222. Harney P. M., Chow T. W. (1971), Crossability between some Pelargonium species. Euphytica 20, 286. Horn W. (1994), Interspecific crossability and inheritance in Pelargonium. Plant Breeding 113, 3-17. Jones C. S., Martínez-Cabrera H. I., Nicotra A. B., Mocko K., Marais E. M., Schlichting C. D. (2013), Phylogenetic influences on leaf trait integration in Pelargonium (Geraniaceae): Convergence, divergence, and historical adaptation to a rapidly changing climate. American Journal of Botany 100, 1306-1321. Jones C. S., Price R. A. (1996), Diversity and evolution of seedling Baupläne in Pelargonium (Geraniaceae). Aliso 14, 281–295. Lavranos J. J., Craib C. L., Condy, G. (1995), Pelargonium hystrix. Flowering Plants of Africa 54, 42-46. LisBalchin M. (1997), A chemotaxonomic study of the Pelargonium (Geraniaceae) species and their modern cultivars. Journal of Horticultural Science 72, 791-795. Marais E. M., Condy, G. (2001), Pelargonium radicatum: Geraniaceae. Flowering Plants of Africa 57, 82-85. Marais E. M., Condy, G. (1995), Pelargonium punctatum. Flowering Plants of Africa 54, 36-37, 39-40. Martínez-Cabrera H. I., Schlichting C. D., Silander J. A., Jones C. S. (2012), Low levels of climate niche conservatism may explain clade diversity patterns in the South African genus Pelargonium (Geraniaceae). American Journal of Botany 99, 954-960. Merxmüller H. (1964), Pelargonium ceratophyllum. Mitt. Bot. StSamml. Münch. 5, 234-235. Neubauer H. F. (1972), Structure of petioles of Pelargonium. Osterreichische Botanische Zeitschrift 120, 391. Neubauer H. F. (1971), Leaf base and stem nodes of Pelargonium. Osterreichische Botanische Zeitschrift 119, 141. Nordenstam B. (1987), Pelargonium caroli-henrici (Geraniaceae), a new species from the Western Cape Province. Plant Systematics and Evolution 155, 333-337. Olivier M. C., van der Walt J. J. A. (1984), The taxonomy of the Pelargonium peltatum (L.) L'Herit. complex. Journal of South African Botany 50, 1-14. Rogers, O. M. (1987), Ethephon overcomes seed scarification requirements of Pelargonium. Acta Horticulturae 201, 165-170. Röschenbleck J., Albers F., Müller K., Weinl S., Kudla J. (2014), Phylogenetics, character evolution and a subgeneric revision of the genus Pelargonium (Geraniaceae). Phytotaxa 159, 31-76. Stafford P. J., Gibby. M. (1992), Pollen morphology of the genus Pelargonium (Geraniaceae). Revues in Paleobotany and Palynology 71, 79-109. Struck M. (1997), Floral divergence and convergence in the genus Pelargonium (Geraniaceae) in southern Africa: ecological and evolutionary considerations. Plant Systematics and Evolution 208, 71-97. Tilney-Basset R. A. E. (1963), Genetics and plastid physiology in Pelargonium. Heredity 18, 485-504. Touloumenidou T., Bakker F. T., Marais E. M., Albers F. (2004), Chromosomal evolution interpreted from the rDNA ITS phylogeny for Pelargonium sect. Hoarea (Geraniaceae). Schumannia 4, 93-106.
van der Walt J. J. A., Albers F., Gibby M. (1990), Delimitation of Pelargonium section Glaucophyllum (Geraniaceae). Plant Systematics and Evolution 171, 15-26.
van der Walt J. J. A., Werker E., Fahn A. (1987), Wood anatomy of Pelargonium (Geraniaceae), IAWA Bulletin 8, 95-108.
van der Walt J. J. A. (1983), The type section of the genus Pelargonium. South African Journal of Botany 2, 257.
van der Walt J. J. A., Vorster P. J. (1981a), Typification of the genus Pelargonium L'Herit. (Family Geraniaceae). Taxon 30, 307.
van der Walt J. J. A., Vorster P. J. (1980), Name changes in Pelargonium (Geraniaceae). J. S. Afr. Bot. 46, 283-292. Vorster P., Gilbert M. G. (1993), Pelargonium wonchiense (Geraniaceae) - a new species from Ethiopia. Nordic Journal of Botany 13, 395-398. Vorster P. (1990), Taxonomy of Pelargonium: Review of the section Otidia, Proceedings of the international Geraniaceae Symposium, University of Stellenbosch 24-26 Sep, pp. 281-294. Williams C. A., Newman M., Gibby M. (2000), The application of leaf phenolic evidence for systematic studies within the genus Pelargonium (Geraniaceae). Biochemical Systematics and Ecology 28, 119-132. Yu S. N., Horn W. A. H. (1988), Additional chromosome numbers in Pelargonium (Geraniaceae), Plant Systematics and Evolution 159, 165-171. This section focuses on books, both technical/taxonomic and horticultural. There is significantly more literature available on Pelargonium cultivars. Armitage, A. M.: "Seed-propagated geraniums and regal geraniums : production guidelines and future concerns", Timber Press, Portland, OR, 1992. Bagust, H.: "Miniature geraniums", Gifford, London, 1968. Bagust, H.: "Miniature and dwarf geraniums (Pelargoniums)", rev. ed., C. Helm, London, 1988. Becker, J., Brawner, F.: "Scented geraniums : knowing, growing, and enjoying scented pelargoniums", Interweave Press, Loveland, Colo., 1996. Bennett, M.: "Geraniums : the successful grower's guide", Hippocrene Books, New York, 1972. Butterfield, H. M.: "Geraniums and pelargoniums for the home garden", University of California, Berkeley, 1953. Clark, D. W. H.: "The Oakleigh guide to geraniums (pelargoniums) : a general introduction", Oakleigh Publications, Alresford, England, 1986. Clark, D. W. H.: "Pelargoniums", Timber Press, Portland, Or., 1988. Clifford, D. P.: "Geraniums", E. Benn, London, 1953. Clifford, D. P.: "Pelargoniums, including the popular 'geranium'", Blandford Press, London, 1958. Clifford, D. P.: "Pelargoniums, including the popular 'geranium'", 2nd ed., Blandford Press, London, 1970. 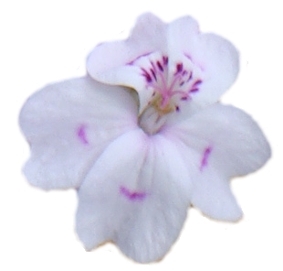 Clifton, R. T. F.: "Geranium family species check list", ed. 4, Geraniaceae Group, Dover, England, 1994. Pt. 1. Erodium; pt. 2. Geranium; pt. 3. Monsonia; pt. 4. Pelargonium; pt. 5. Sarcocaulon; pt. 6. Superceded genera; pt. 7. Hypseocharis. Clifton, W. A. R.: "The geranium, its history and cultivation", 2nd ed. (rev. ), B.H. Gadd, Worthing, 1935(?). Clifton, W. A. R.: "The geranium: its history and cultivation", 5th ed., Crowther & Willis, Chichester, 1945. Conder, S.: "The complete geranium : cultivation, cooking, and crafts", 1st ed., Crown Publishers, Inc., New York, N.Y., 1992. Craib, C.: "Observations on the ecology of South African Geraniaceae, and hints on their cultivation. Part 1. ", Hystrix Natural History and Cultivation Series 1, 1992. Craib, C.: "Observations on the ecology of South African Geraniaceae, and hints on their cultivation. Part 2. ", Hystrix Natural History and Cultivation Series 1, 1992. Craib, C.: "Geophytic Pelargoniums. Field and Cultivation Studies of Pelargonium section Hoarea", Umdaus Press, 2001. Cross, J. E.: "The book of the geranium", Saturn Press, London, 1951. Cross, J. E.: "Pelargoniums for all purposes", W. H. & L. Collingridge, London, 1965. Eggli, U. (Ed. ): "Illustrated Handbook of Succulent Plants. Dicotyledons", Springer, Berlin, 2002. (Pelargonium species treated in the Geraniaceae section by F. Albers). Esser, M.: "Pelargoniums", Rebo Productions, Lisse, 1998. ISBN 9039602514. Fogg, H. G. W. "Geranium growing", W. & G. Foyle, London, 1955. Fogg, H. G. W.: "Geraniums and pelargoniums", J. Gifford, London, 1964. Fogg, H. G. W.: "Geraniums and pelargoniums", J. Gifford, London, 1975. Horst, R. K., Nelson P. E.: "Diseases of geraniums", Cornell University, Ithaca, N.Y., 1985. Key, H.: "Pelargoniums", 3rd ed., Cassell, London, 1993. ISBN 0304320374. Krauss, H. K.: "Geraniums for home and garden", Macmillan, New York, 1955. Marais E. M. (1994a), Taxonomic Studies in Pelargonium, Section Hoarea (Geraniaceae), PhD Thesis, University of Stellenbosch. Mastalerz, J. W., Holcomb, E. J. (Eds. ): "Geraniums: a manual on the culture of geraniums as a greenhouse crop", 3rd ed., Pennsylvania Flower Growers, University Park, PA, 1982. Miller, Diana: "Pelargoniums, a gardener's guide to the species and their cultivars and hybrids", Batsford Ltd., London, 1996. Moore, R.: "In vitro propagation of geranium", Avery's plant tissue culture series, Avery Publishing Group, Wayne, NJ, 1985. Narayana, M. R.: "Cultivation of geranium for its oil in India", rev. ed., Central Institute of Medicinal and Aromatic Plants, Lucknow, 1990. Proudlock, H. P.: "Pelargoniums, including geraniums", Lothian Pub. Co., Melbourne, 1969. Riedmiller, A.: "Geranien, Pelargonien", Gräfe und Unzer, München, 1988. Riedmiller, A.: "Geranien, Pelargonien", 2nd ed., Gräfe und Unzer, München, 1990. Riedmiller, A.: "Geranien, Pelargonien", 3rd ed., Gräfe und Unzer, München, 1992. Scharff, J.: "Geraniums", T.F.H. Publications, Jersey City, N.J., 1962. Schulz, P.: "All about geraniums", Doubleday, Garden City, NY, 1965. Shellard, A.: "Geraniums for home and garden", David & Charles, Newton Abbot, 1981. Shellard, A.: "Geraniums", David & Charles, Newton Abbot, 1984. Stackhouse, S.: "The Australian house and garden book of geraniums", Australian house and garden book no. 4, Sportshelf, New Rochelle, N.Y.
Taylor, J.: "Geraniums and pelargoniums : the complete guide to cultivation, propagation, and exhibition", Crowood Press, Ramsbury, Marlborough, Wiltshire, 1988. Taylor, J.: "Pelargoniums : for colour and variety", Crowood Press, Ramsbury, Marlborough, Wiltshire, 1990.
van der Walt, J. J. A.: "Pelargoniums of Southern Africa", Vol. 1, Purnell, Cape Town, 1977 (POSA1). van der Walt, J. J. A.: "Pelargoniums of Southern Africa", Vol. 2, Juta, Cape Town, 1977 (POSA2). van der Walt, J. J. A., Vorster P. J.: "Pelargoniums of Southern Africa including some representative species from other parts of the worldincluding some representative species from other parts of the world", Vol. 3, Kirstenbosch National Botanic Gardens, 1988 (POSA3). Webb, William J.: "The Palragonium Family. The Species of Pelargonium , Monsonia and Sarcocaulon", Croom Helm, London, 1984. ISBN 0709927347. White, J. W. (Ed. ): "Geraniums IV : the growers manual", 4th ed., Ball Pub., Geneva, Ill., 1993. Wilson, H. Van Pelt: "Geraniums, pelargoniums, for windows and gardens. ", 3rd ed., M. Barrows, New York, 1957. Wilson, H. Van Pelt: "The joy of geraniums; the standard guide to the selection, culture, and use of the pelargonium", M. Barrows, New York, 1965. Wilson, H. Van Pelt: "Geraniums, pelargoniums for windows and gardens", W. Morrow & Co., New York, 1972. Wilson, H. Van Pelt: "The joy of geraniums : the standard guide to the selection, culture, and use of the pelargonium", Morrow Quill Paperbacks, New York, 1980. Wood, H. J.: "Pelargoniums : a complete guide to their cultivation", 2nd ed., Faber, London, 1966.